Nicknamed "Clyde," the RoboSimian robot built by engineers at NASA's Jet Propulsion Laboratory is facing off against other robots in the DARPA Robotics Challenge in Pomona, California on June 5 and 6. RoboSimian – an apelike NASA robot that can map its environment in 3D – is facing off against a field of other robots this week to see which automaton has the right stuff for the DARPA Robotics Challenge Finals. The gangly-armed RoboSimian, nicknamed "Clyde," was built by engineers at NASA's Jet Propulsion Laboratory (JPL) in Pasadena, California, to cross tough terrain and use hand-like manipulators. It is one of 25 teams that qualified for the DARPA Robotics Challenge Finals for disaster-response robots underway today and Saturday (June 5-6) at the Fairplex in Pomona, California. The winning team will nab a $2 million prize. You can see a video of how RoboSimian moves here. During the DARPA contest, RoboSimian and its competitors will attempt to complete four different courses, each taking about an hour to complete. What makes RoboSimian stand out, JPL officials explained in the statement, is the robot's ability to go over difficult terrain and perform tasks requiring extreme dexterity. Among its attributes is a LiDAR (Light Detection and Ranging) device that lets RoboSimian sketch out its environment in three dimensions. DARPA is the acronym for the Defense Advanced Research Projects Agency, the U.S. military's frontier for high-risk projects that have an uncertain return. The agency is holding this contest as part of a three-year effort to encourage development in robots to help people during disasters. The work was started following a 2011 earthquake and tsunami that caused widespread damage in Japan. 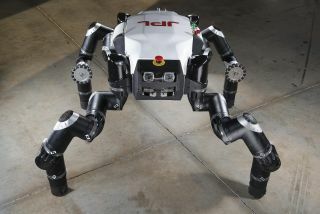 RoboSimian is a project led by JPL, which also has partners at the University of California, Santa Barbara, and the California Institute of Technology in Pasadena. The two-day DARPA Robotics Challenge is open to the public. JPL will also have a booth on-site, along with 70 other groups that have information available on how they help with disaster response. In December, RoboSimian was chosen over another JPL-developed robot, called Surrogate, because RoboSimian is a more "all-around solution," officials said at the time. Surrogate requires a track to move around, while RoboSimian's limbs allow it to navigate all sorts of terrain.